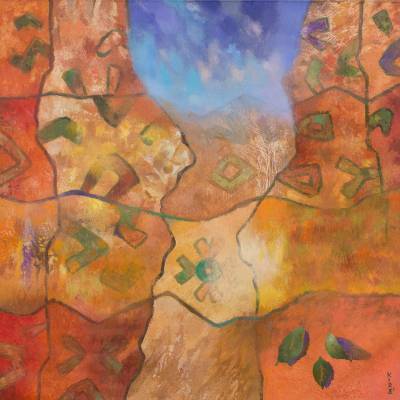 Signed Earth-Tone Abstract Painting from Peru (2015), "Andean Seeds"
For this painting, Peruvian artist Kiro draws inspiration from the beauty of the Andean countryside, which gives life to this composition. Within an abstract, earthen grid, green seeds reside, ready to flourish. According to the artist, this piece transcends time, as it represents the future flowering of planted seeds. Titled Semillas de los Andes in Spanish.